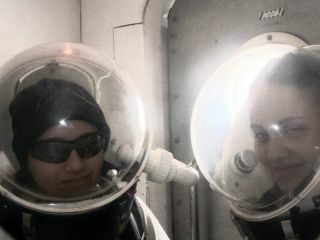 Veronica Ann Zabala-Aliberto (left) and daughter Angie waiting for 'decompression' in their Mars suits during the March 2007 FLAME expedition at the Mars Desert Research Station in Utah. Do you wantthe opportunity to work in the space sector? Don?t we all! Many spaceenthusiasts say human and robotic space exploration is an addiction. Once youstart going to the International Space Development Conferences (ISDCs), visit aspaceport or two or religiously visit as many space-related websites you canwithout getting caught by your boss while you?re on the clock...you just can?tstop. One of themost grueling yet inspiring event in one?s life is to stand in front of acrowded room with some of your childhood heroes sitting in the first couple ofrows, giving a lecture on human and robotic space exploration and how we musthave a robust public policy program in order to ensure the stability of ourgoals for the advancement of technology and exploration.? That sameday, after exchanging hand shakes and business cards, you quickly go home,change your outfit, squeeze as much education outreach materials in your car asyou can and race to your neighborhood high school in order to give a lecture toabout one-hundred students and educators on how they can achieve their goals bystudying math, science and technology and encouraging them to activelyparticipate in their local university?s internship programs and joinspace-related organizations. Then, after your lecture is over, you pass outposters, lithographs and your business cards (again) to those students whoeagerly want to know more on how to be a scientist, engineer or an astronaut.? At the endof your day you think back on all that was accomplished in the last twelve hours.You then realize you didn?t get paid at all for what you did! The lecture yougave in the morning was for the JPL Solar System Ambassadors, a public outreachprogram designed to work with motivated volunteers across the nation. The 494 volunteerAmbassadors communicate the excitement of JPL's space exploration missions andinformation about recent discoveries to their local communities, bringing theexcitement of space to the public. The highschool lecture was for the National Space Society, another volunteer-basedorganization dedicated to the creation of a spacefaring civilization. Thislecture promoted human spaceflight, how to be an astronaut, how to save energyby using solar cells, and included some fantastic images from the Cassini mission, the Mars ExplorationRovers and a couple from the Hubble Telescope to depict how far our goalsreally stretch. As astudent, I was lucky to be paid by the NASA Space Grant Consortium to learn, asan Intern, how to conduct planetary investigations related to geology,astrobiology and engineering. With the guidance of my Mentor, I contributed toplanetary missions such as the MarsExploration Rover (MER) and the European Space Agency?s Mars Express. Today,I contribute to the upcoming Lunar Reconnaissance Orbiter mission. All thisfrom being a student worker who started out at $7.00 an hour! As timewent on I realized there was more to learn than what was being offered in theclassroom. That?s when I joined space-related organizations as a chapter memberto become more active in the space community. The more you are involved in, themore you learn. I put more time aside for my volunteer duties in eachorganization, and now I am heavily involved in helping to make a difference inthe space sector as a Director of the National Space Society, Chapter Presidentfor the NSS Phoenix Chapter and a JPL Solar System Ambassador. I have alsoparticipated and now command several Martiananalogue missions in order to help develop the protocols necessary forhuman exploration and settlement of Mars.? Ahhhh...ifI only got a dollar for each hour I have volunteered! ?How didyou get to where you are today?? ?Why are wespending so much money on space exploration when we have so many problems hereon Earth?? I have toadmit it also saddens me when I hear those who say, ?I will NEVER see humansback on the Moon or on the surface of Mars in my lifetime!? I personally wasonly seven months old when Apollo 17 reached the Moon.I pray that I was not born too early to see humans to the Moon, Mars andbeyond. I alwaysend my presentations by encouraging the audience to actively participate in organizationsthat make a positive impact in their communities and in the space sector. I askthem if they would work for space even if they didn?t get a paycheck. Only adedicated few raise their hands. Now askyourself...if I asked this question and you were in the audience, would you haveraised your hand?? VeronicaAnn Zabala-Aliberto is the National Space Society Board of Director (Region 3),NSS Phone Tree Coordinator, NSS Phoenix Chapter President and is on several NSSCommittees such as the Policy, Strategic, and Space Book Committees. She iscurrently working on her Bachelors of Science degree in geology within theSchool of Earth and Space Exploration at Arizona State University.